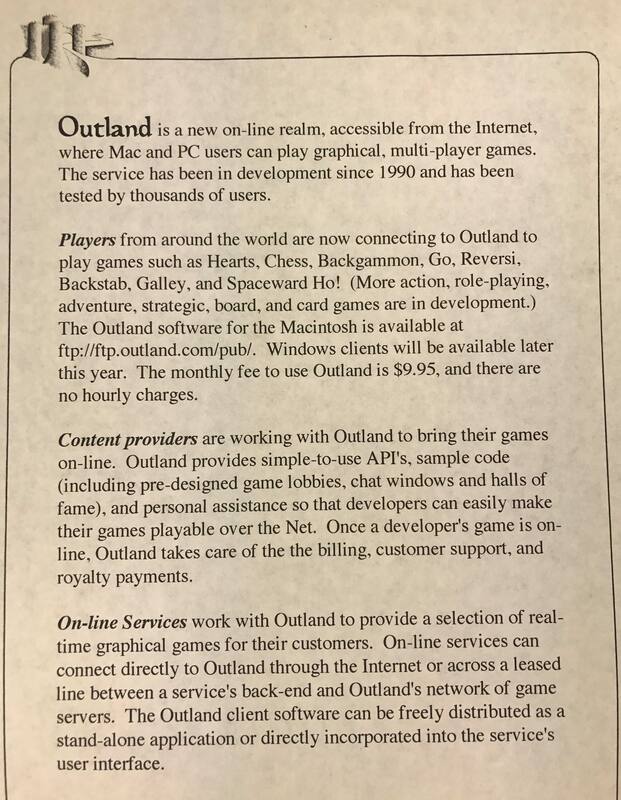 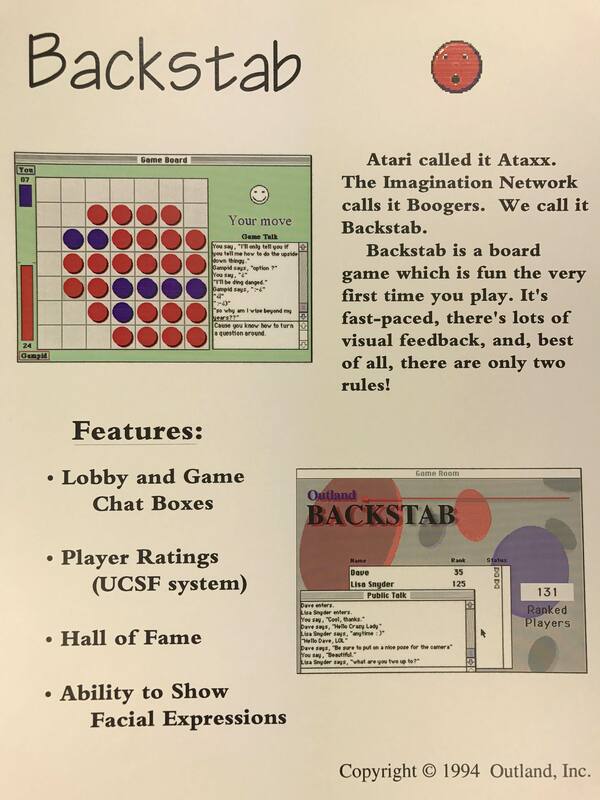 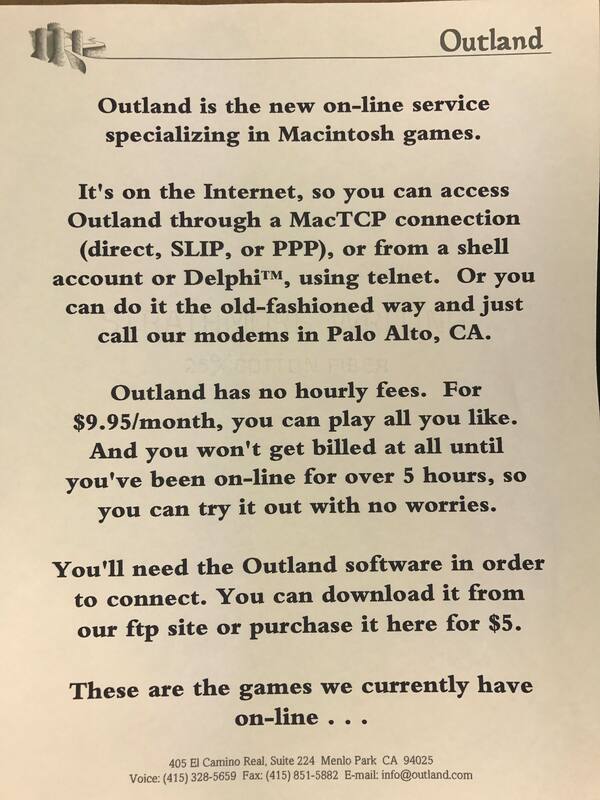 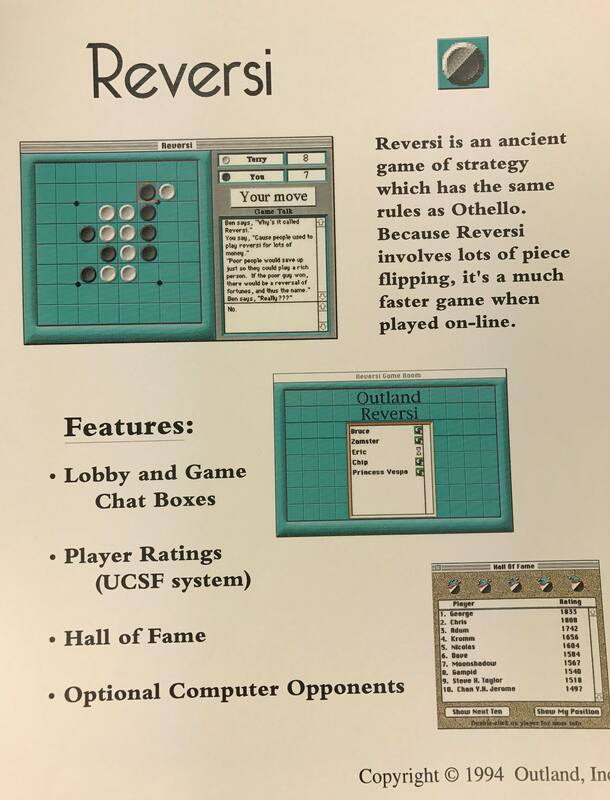 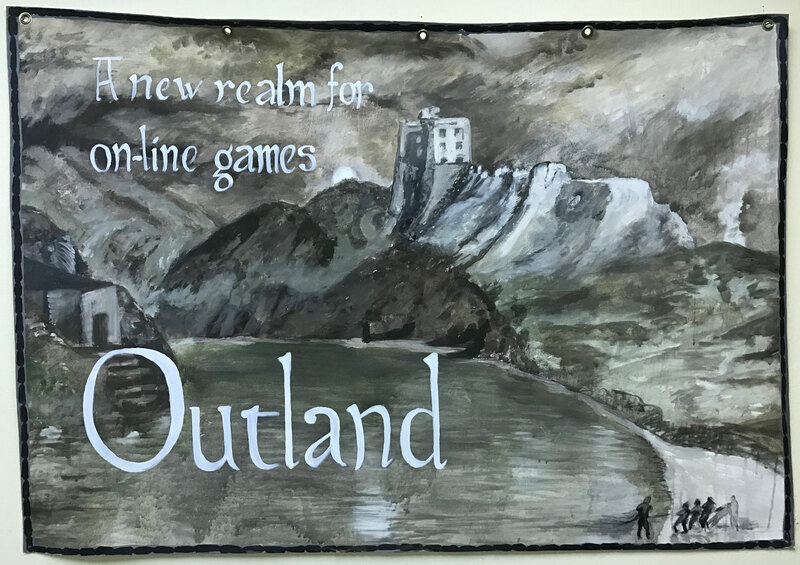 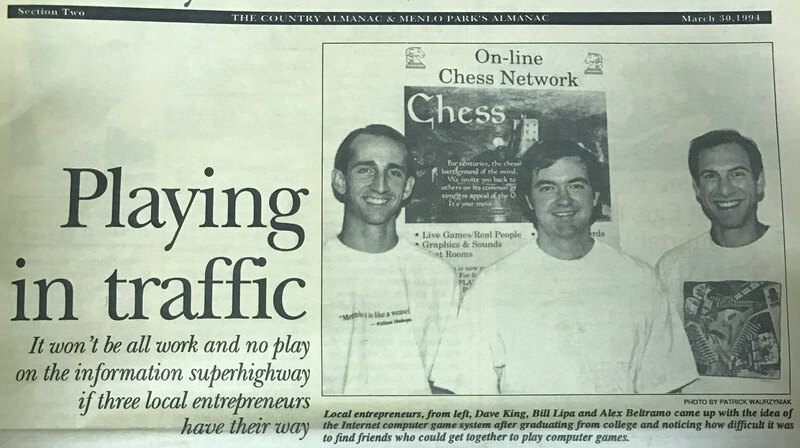 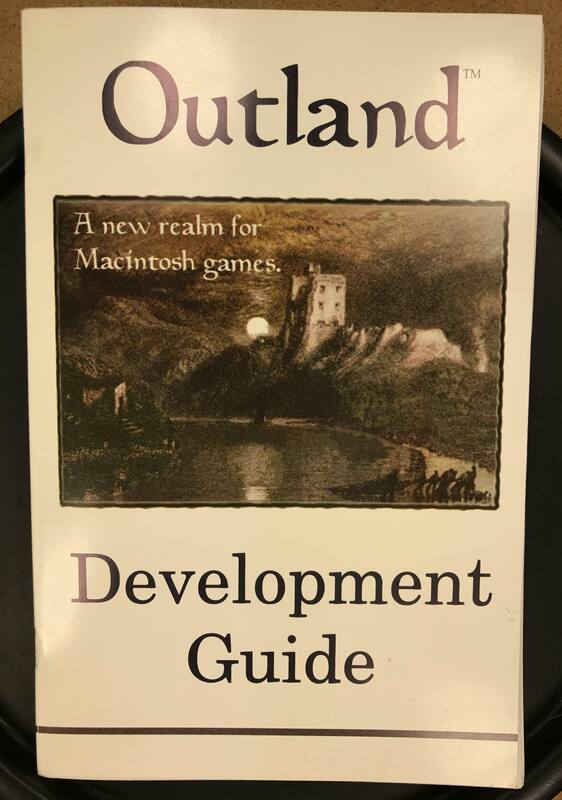 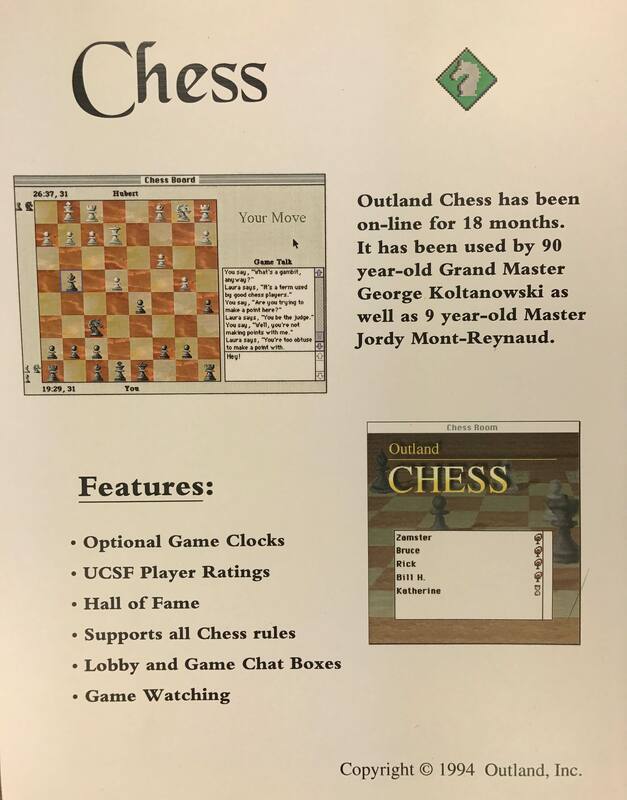 Outland was a online gaming service started in the early 1990s by three friends: Alex Beltramo, David King, and Bill Lipa. 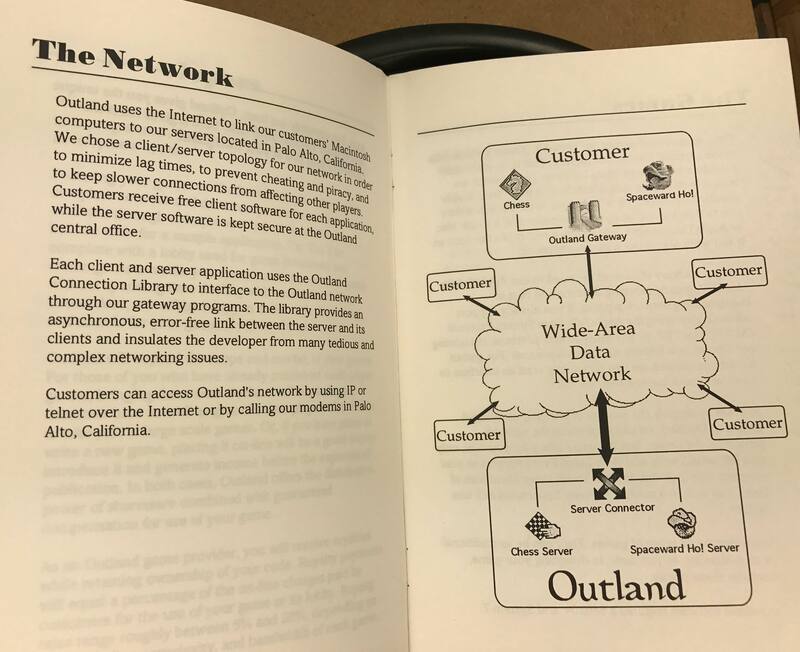 It was so early to market that the original release predated the commercial use of the Internet, instead relying upon a T1 connection to ARPAnet from Stanford University and dial-up connections to a central office. 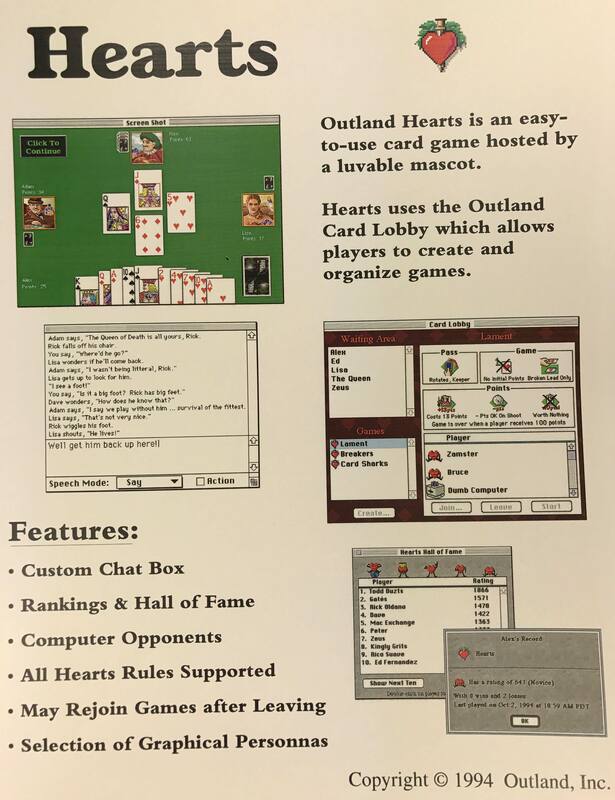 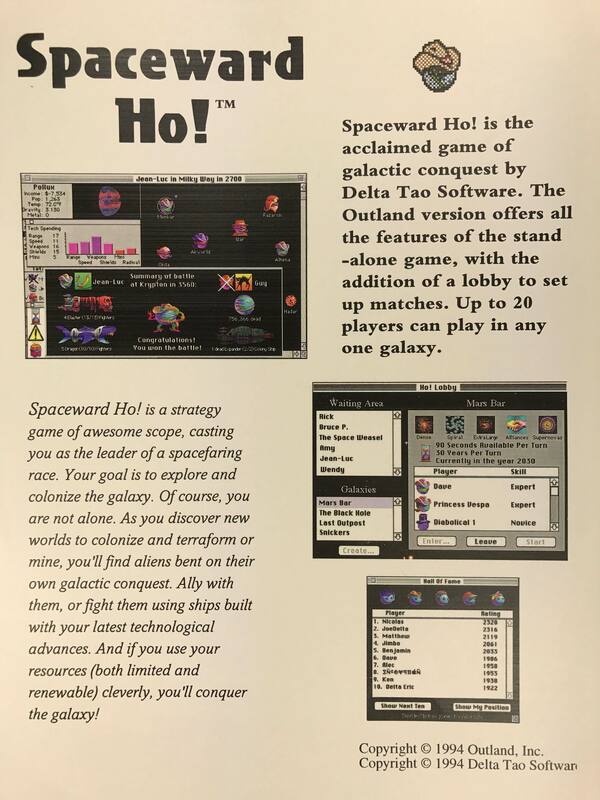 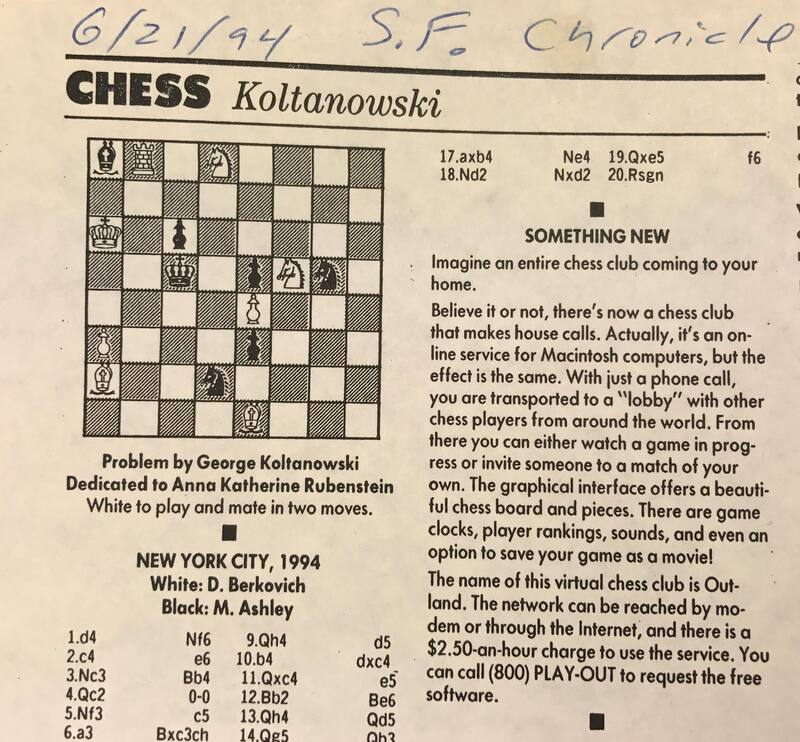 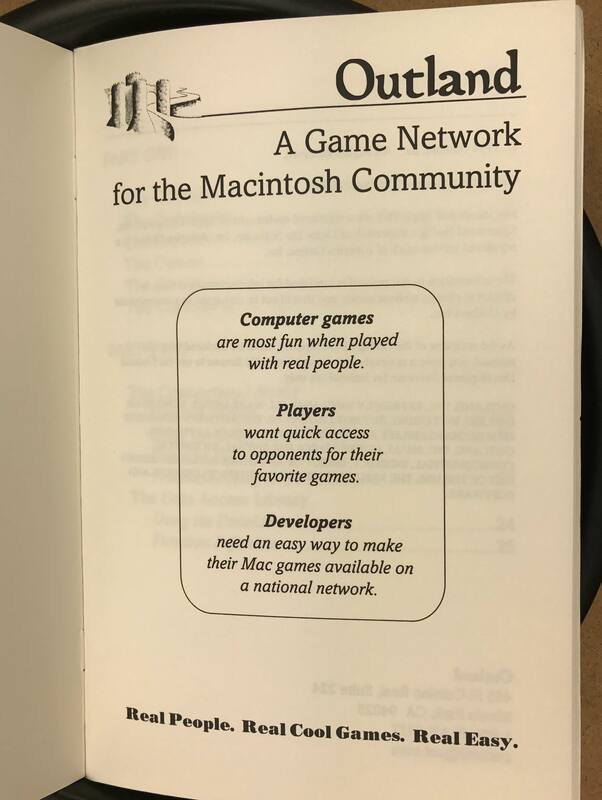 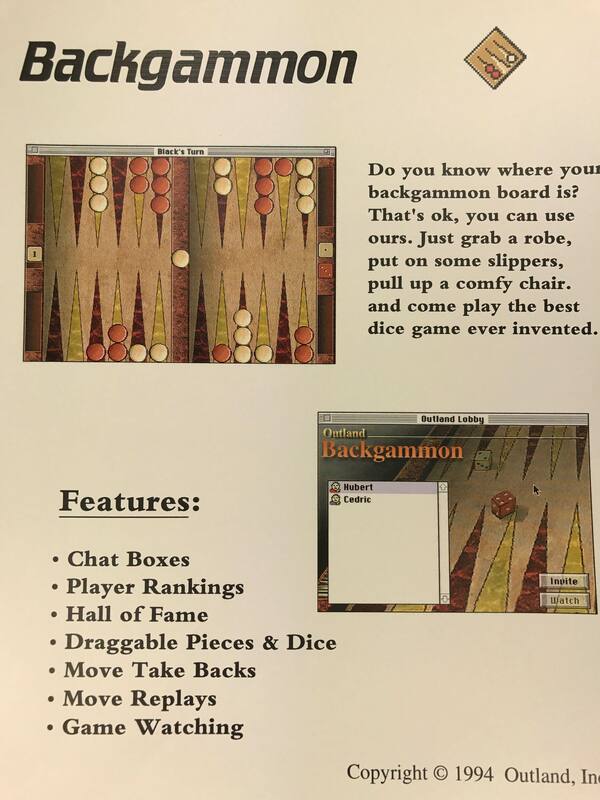 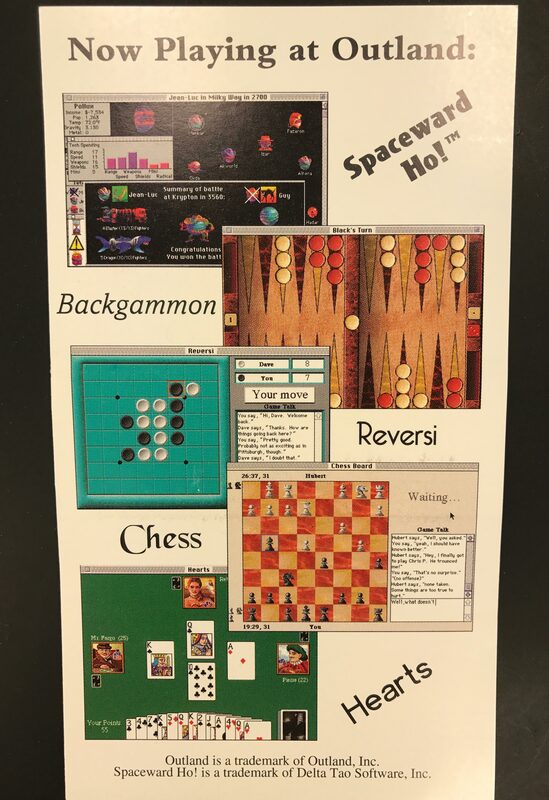 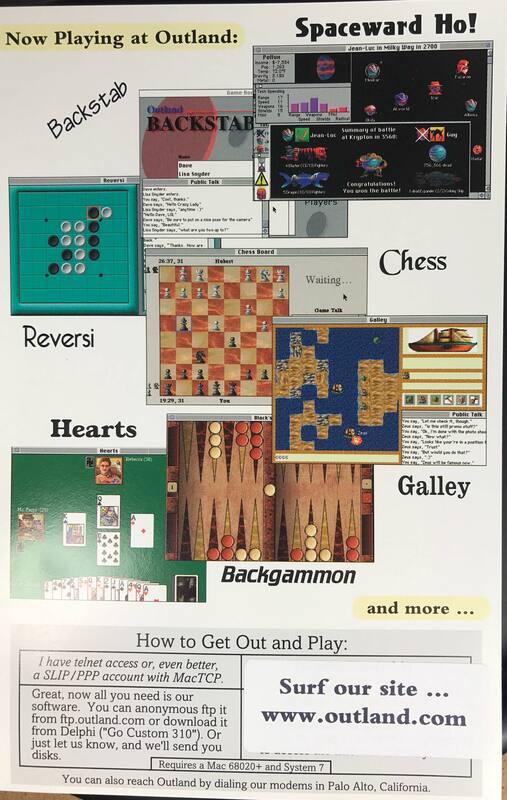 The service offered Macintosh games such as Chess, Hearts, and Spaceward Ho. 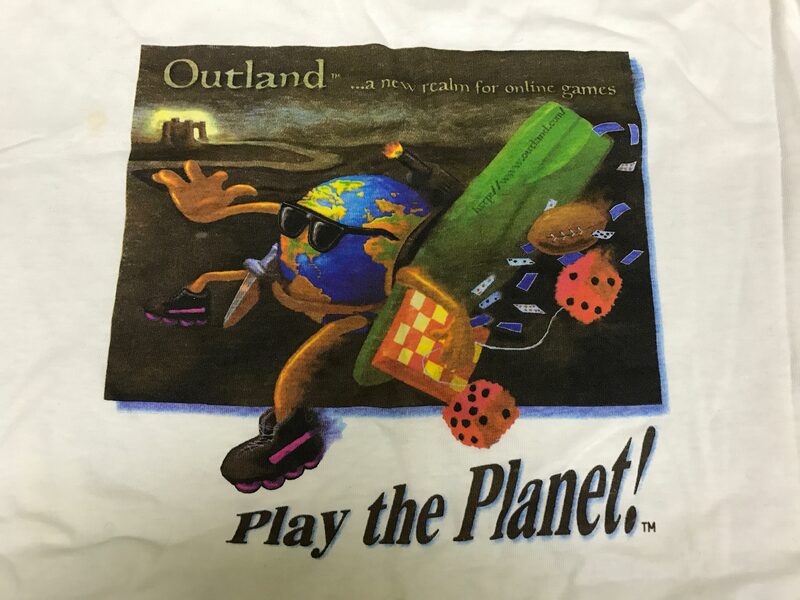 Outland merged with another small company in 1995 to form the Total Entertainment Network, which offered online play for popular PC games such as Duke Nukem 3D and Nascar. 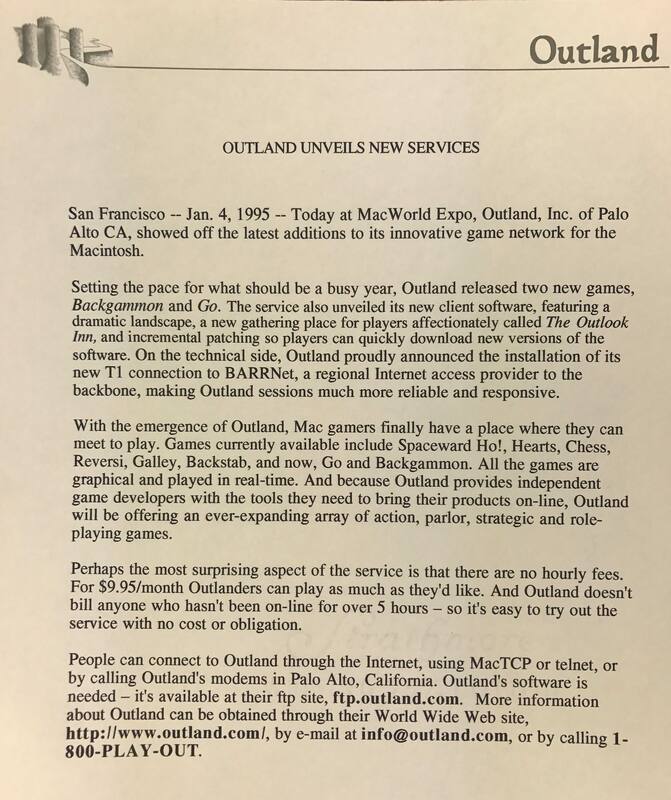 Eventually, Total Entertainment Network changed its focus to web games and renamed itself to Pogo.com. 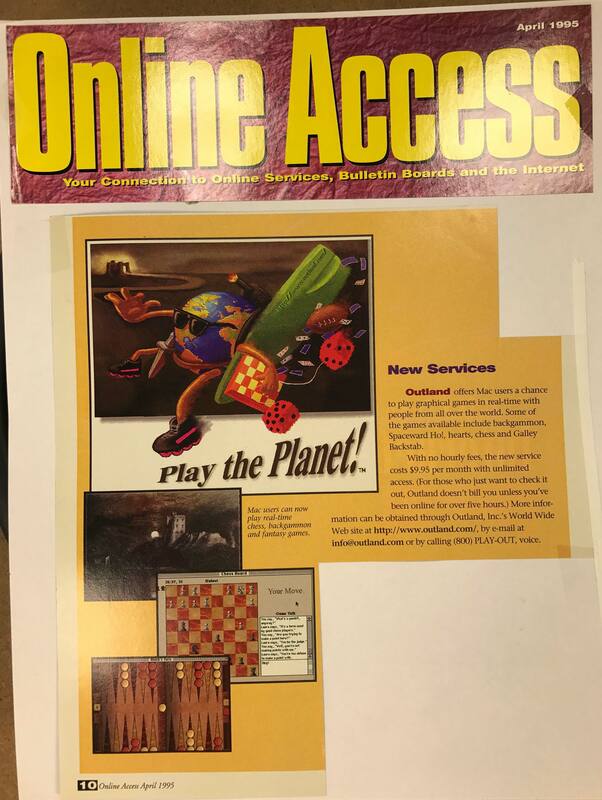 In 2001, Pogo.com was acquired by Electronic Arts, the dominant video game publisher at the time. 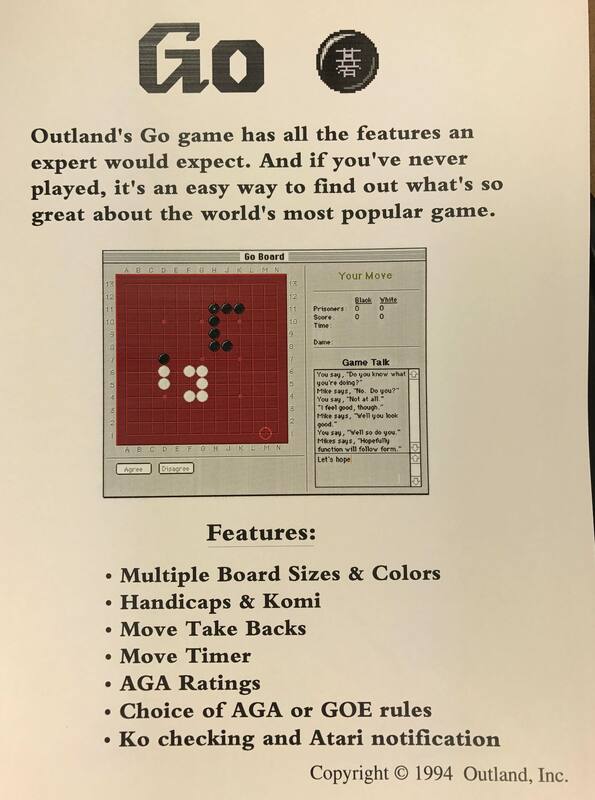 As of 2007, Pogo ranked as one of the top ten Internet sites measured by time spent online. 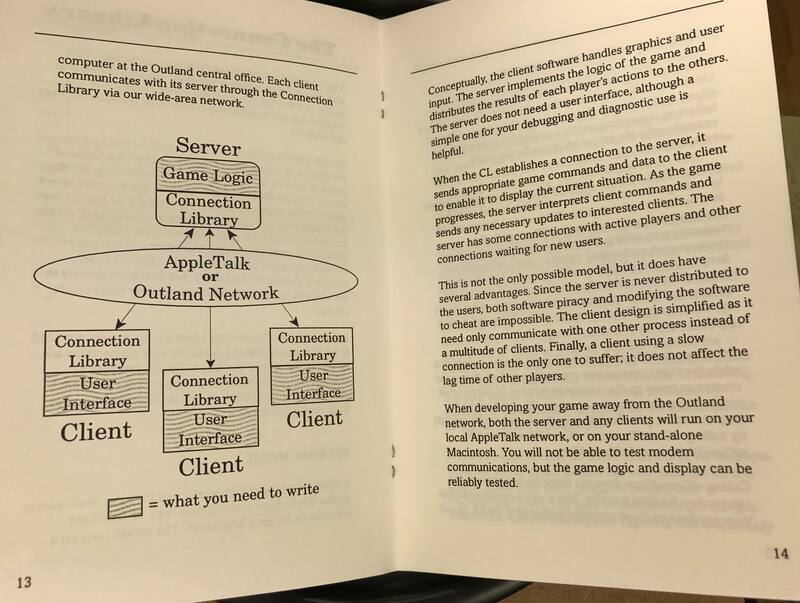 Outland was available from roughly 1993 to 1998, at which point its custom database server died a horrible death. 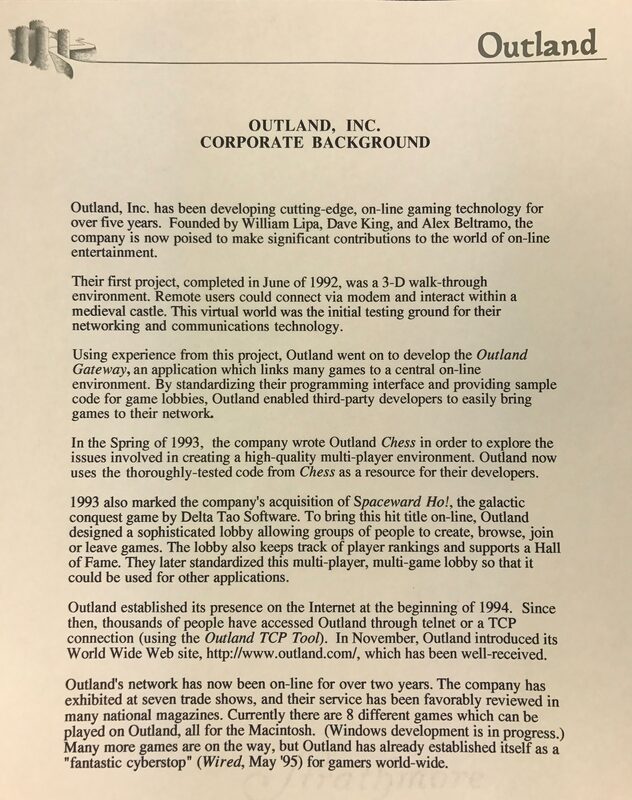 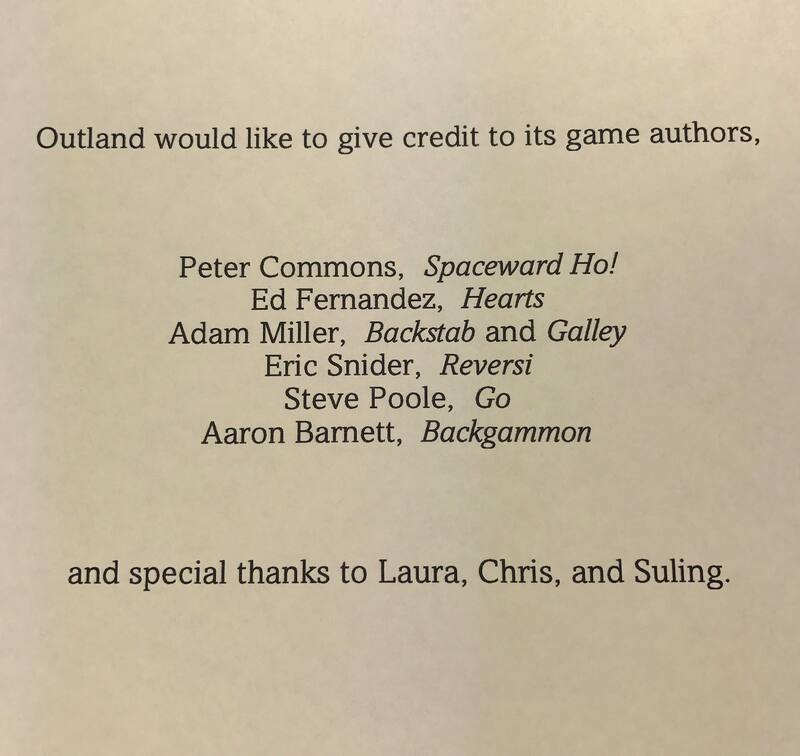 The Outland founders were too busy with TEN and Pogo work to bring it back to life. 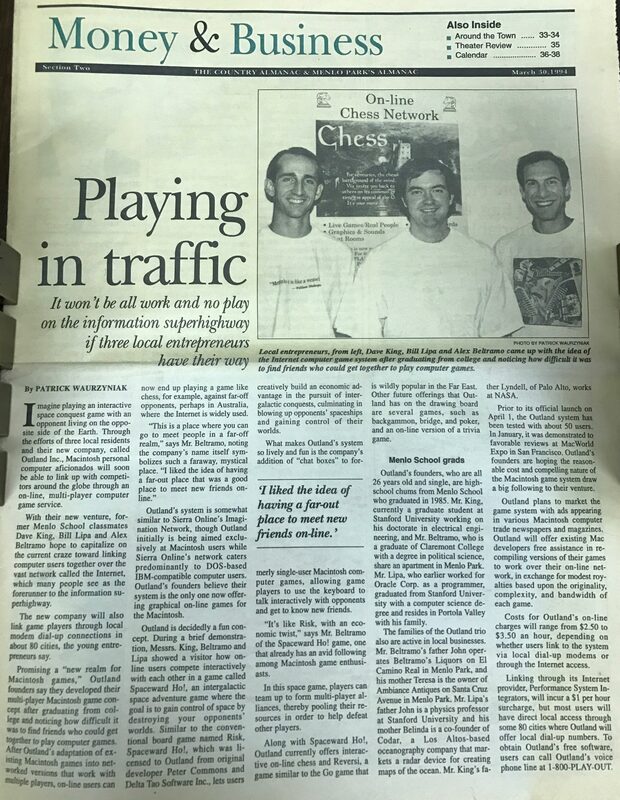 Dave, Bill and Alex remain close friends. 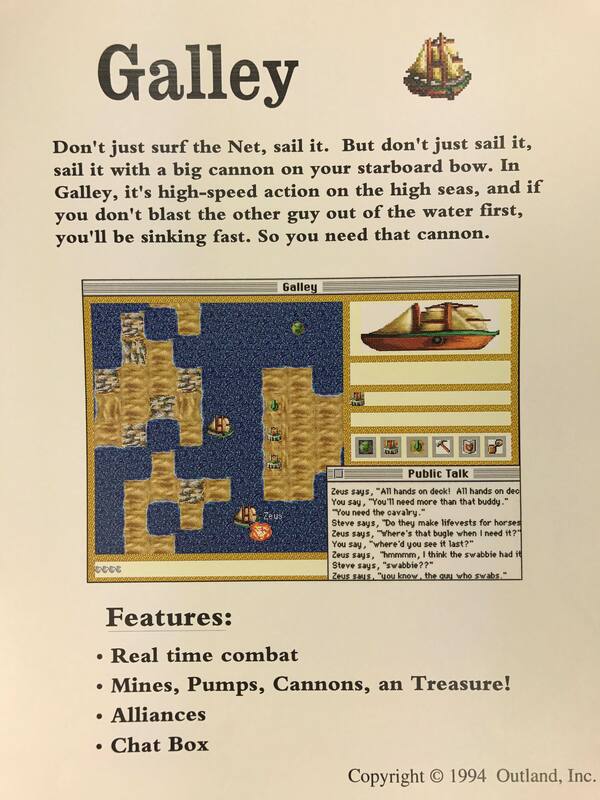 They are still developing online games, among them Dungeoneers.